The one problem? Unlike many of the projects I have found, it didn’t link out to any instructions. How hard could it be? I decided to head to Michael’s craft store. 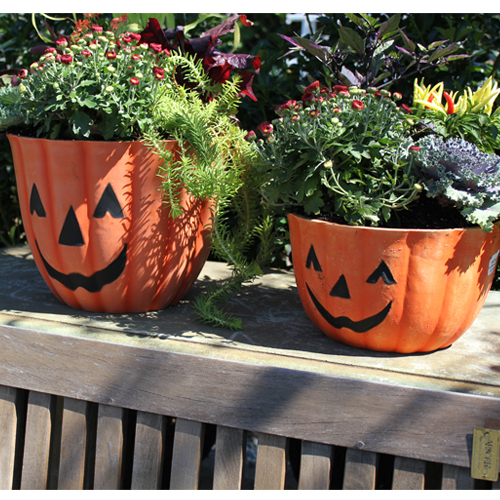 Right in front of the store were large baskets of faux pumpkins for 50% off! I hadn’t even thought of using fake but how great would it be to have this display year after year? 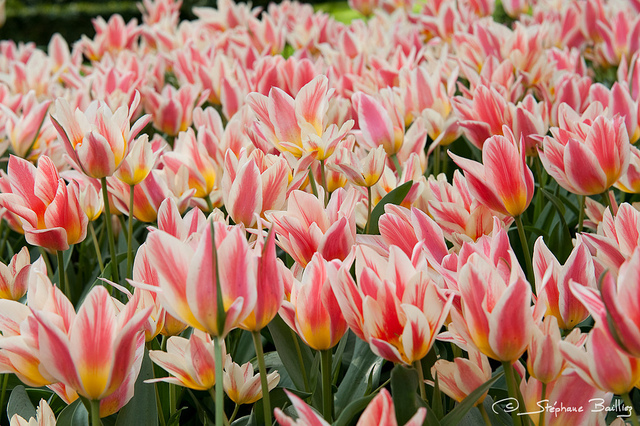 I picked out a large white for the initial and a smaller orange for the top. 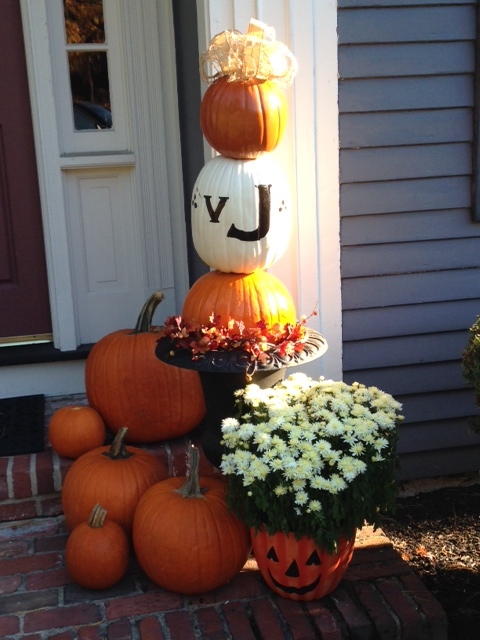 My thoughts were to use a real pumpkin as the base to anchor the topiary. Also at Michael’s I purchased: Black Acrylic Paint, a set of decent artist paint brushes, waterproofing gloss, waterproofing spray, a decorative fall wreath, a long piece of faux leaf garland, and two spools of wired ribbon (two because I couldn’t decide between them and decided to incorporate both). 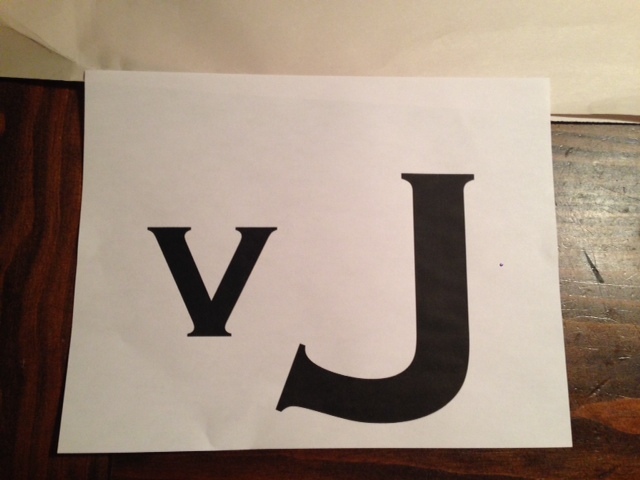 Once back at home, I logged onto my computer and fired up Word to find and print out a stencil for the initial. My last name has two letters so I needed to find a font that worked for that. My favorite is Copperplate Gothic and since it looked good for both letters, I sized it accordingly (450) and printed it out. Next step was how to transfer it to my white pumpkin. 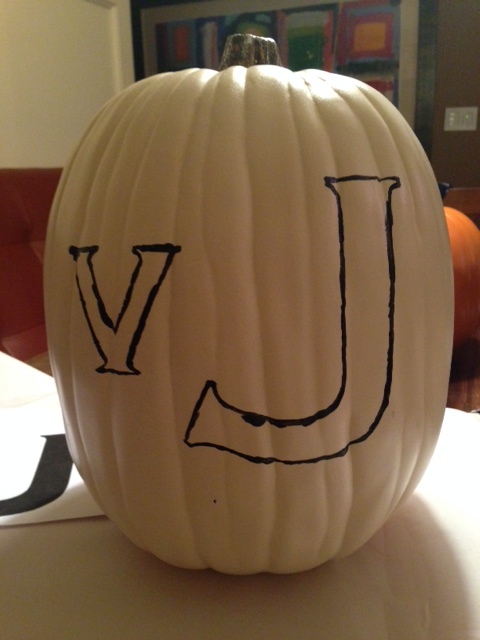 After carving pumpkins for so many years, it seemed to make the most sense to tape the piece of paper with my initials to the white pumpkin and press the outline into the pumpkin using a corn on the cob holder. I know, super technical, right? Any sort of device that would poke a hole through the paper and into the pumpkin works. 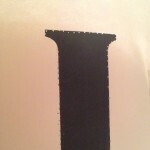 Using the tiny holes as a guide, I outlined my initials. The paint dried pretty quickly and I was able to do a couple of coats of the black paint before letting it set for the night. 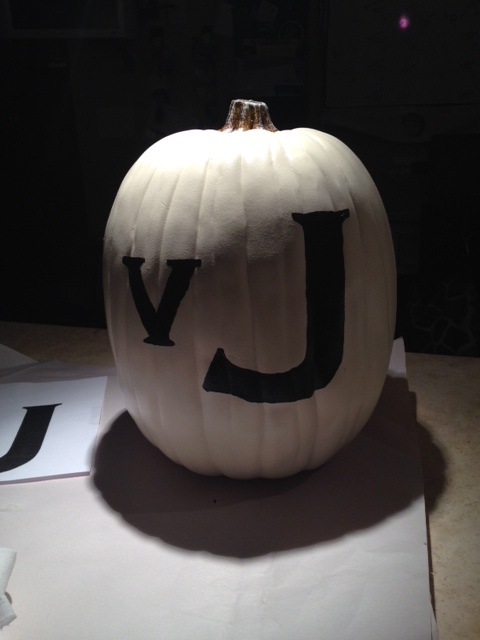 Next came the task of figuring out how to attach the smaller pumpkin to the top of my white, initialed pumpkin. Thankfully, the fake pumpkins were hollow which I didn’t realize until I cut into the bottom of the the orange one with a pairing knife (next time I think a box cutter would be a better choice). To secure the small, orange pumpkin to the white one, I plugged in my glue gun and applied significant amounts of glue to both and held them together until they were somewhat dry. 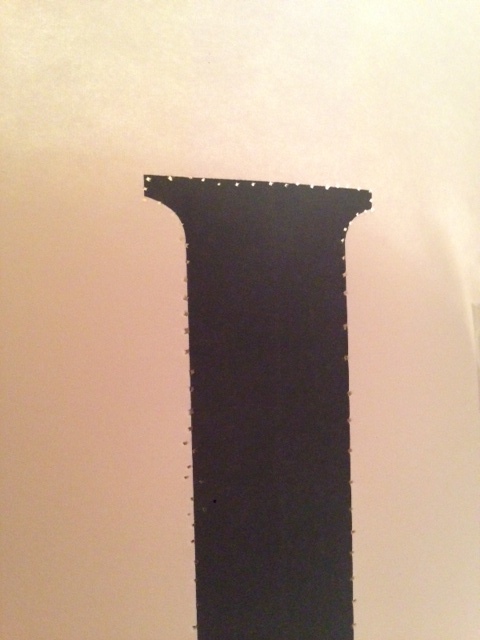 Doing the ribbon made me far more nervous than painting the initial. I am not a good bow maker so what I did was loop the two ribbons I had purchased together and, using my glue gun, stuck them to the top of the pumpkin in a bow-like fashion. I let the project sit overnight so that both the paint and the glue could properly dry. The next day, I applied another coat of black paint to the initials, waited 6 hours and then applied a waterproofing gloss to both pumpkins. Be careful that your paint is completely dry otherwise you can smudge the paint while trying to apply the gloss. 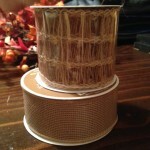 After this all dried completely, I was ready to take my creation outside to my front stoop and set it up. This is where things got tricky. 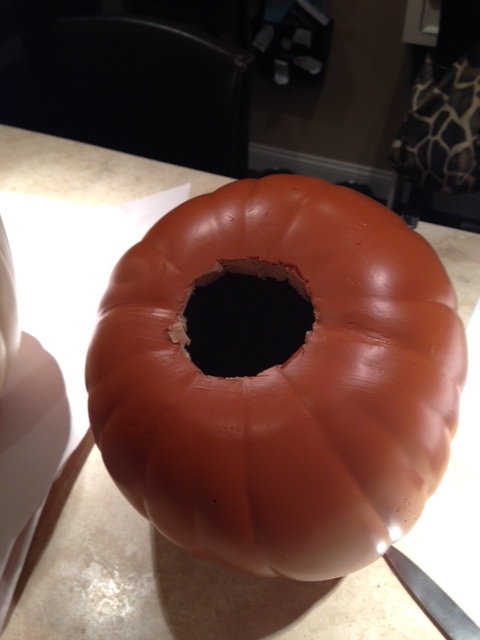 Setting up the wreath, garland and real pumpkin inside of my black urn was easy. 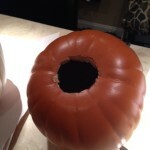 Attaching fake pumpkins to a real pumpkin so that they were secure and straight proved to be somewhat of a challenge. Glue was not going to work. I decided to use very long and large screws which I inserted into the bottom of the white pumpkin and made corresponding holes in the real pumpkin I bought. This still did not answer the problem of the pumpkins being flush against each other so I added a little duct tape into the mix (at the back of course) which could support them a bit. 1) I will use real pumpkins for all three. Although the fake pumpkins are great for their reusability, they are lacking in the weight necessary to stack them easily. The lack of weight also proves challenging in a strong wind. 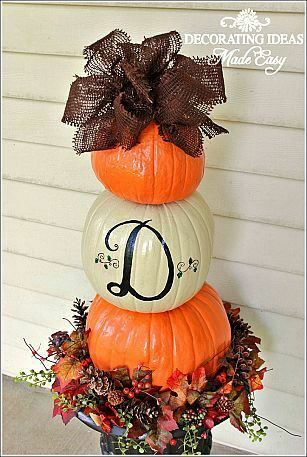 That being said, this same project using fake pumpkins is perfect for an indoor display. 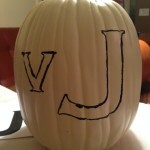 2) I will use smaller pumpkins or perhaps more squat pumpkins vs. the long white one I chose. Short, fat pumpkins seem to be able to nestle into each other better than tall, thin ones. 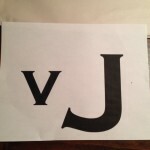 3) I will paint the letters larger. 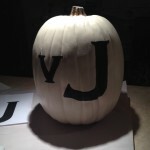 Once the three pumpkins are assembled, the letters don’t pop out as well. 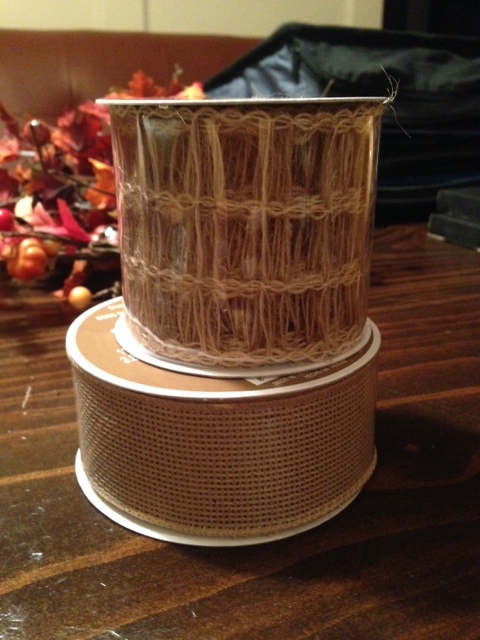 There have been Pinterest projects that I’ve abandoned in frustration but this was one that I am happy I embarked upon. It was worth the effort!